At Columbia Business School Executive Education, we acknowledge the investment executives make in their professional development with two, customizable certificate options. Certificate holders receive select Columbia Business School alumni benefits and join a powerful, global network of over 46,000 alumni. Earn your Certificate in Business Excellence by completing 18 days of programming over four years. Create your customized learning path, assembling programs in any or all categories (comprehensive management, finance, leadership, marketing, social enterprise, or strategy) that will best help you meet your professional development goals. You may accrue up to 8 credits from online offerings towards the 18 days of programming, with each completed online program granting one certificate credit. Contact our Learning Solutions specialists at 212-854-3395 or execed@columbia.edu to discuss your specific development goals or visit our program finder to map your path to your Certificate in Business Excellence. When you complete 13 days of programming, with eight of those days in one subject area, over four years or less, you will earn a Certificate in Management, Finance, Leadership, Marketing, Social Enterprise, or Strategy. You may accrue up to 3 credits from online offerings towards the 13 days of programming, with each completed online program granting one certificate credit. Contact our Learning Solutions specialists at 212-854-3395 or execed@columbia.edu to discuss your specific development goals or visit our program finder to map your certificate path today. As a private business, locally owned and operated competing against major multi-national corporations with unlimited resources you have to really dig deep to look for your competitive advantages. I consider the CIBE and the journey I took to complete as one such competitive advantage. We continue to maintain and more importantly flourish despite the intense competition and the skills learned through my involvement with CIBE are an important part of our organization’s success. Earning the CIBE is a realistic goal, really, with just one week per year for four years to obtain. This works fantastically well for candidates who strive for professional development but have limited time to re-enter business school on a full or part-time basis. A certificate in business excellence, keen business knowledge, a network of international peers, and alumni status – I have made the right decision and the benefits personally and professionally are evident. Columbia is a leading institute of higher learning and has a long history of driving thought leadership and business excellence. I wanted the best education and experience available and I felt that Columbia Business School’s program was the epitome of executive education on every front. 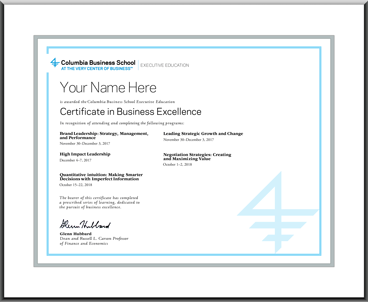 I decided to earn Columbia’s Certificate in Business Excellence because of the added benefits that this unique certificate program offers beyond the education programs. Having this certificate will add a lifetime of value to my resume and open up a new network through the alumni benefits that it makes available. I think it's always great to get recognition for something. I was looking at a number of other executive education style courses across Australia, the United States, and Canada. There’s not much recognition of something that actually is very beneficial to people, that definitely stretches thinking, and gives us new tools to use. With the program I took, we touched on a lot of the areas that are critical to an MBA. To walk away from my experience with the CIBE is a recognition of that. The certificate helps me reach my highest potential in my career and life. It enhances my abilities as a leader, broadens my outlook, enhances my confidence and credibility, and expands my network. The granting of alumni benefits means that I can continue to network and grow. I am able to attend events all over the world, which will give me access to cutting-edge, innovative thinking. The certificate itself offers a seal of approval for the investment I have made in myself. Columbia offers an exceptional diversity of programs across a range of disciplines that meet my career goals and the outstanding reputation of Columbia Business School meant that there was never any doubt that the certificate would enhance my standing in the business community.